This Monster University cake was fun to make. It was made for a 7 year old boy. He was so surprised when he saw it. He loved the movie Monster University. This cake was three tiers. Each layer was colored the same as the outside. So it was a white cake colored with food coloring gel. I liked to use gel because you can get better colors. The top two layers are covered with fondant with homemade butter cream frosting and the bottom layer is covered in butter cream using the grass tip to.make it look like fur. 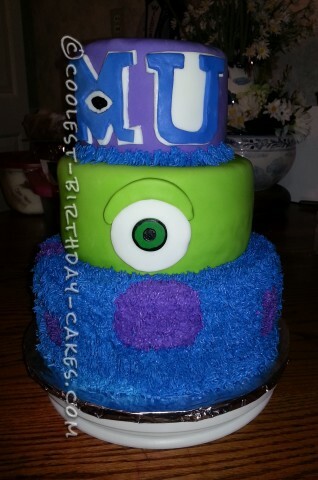 The eye was also made of fondant. To secure the cake for transport I used a dowel rod all the way down through all three tiers.